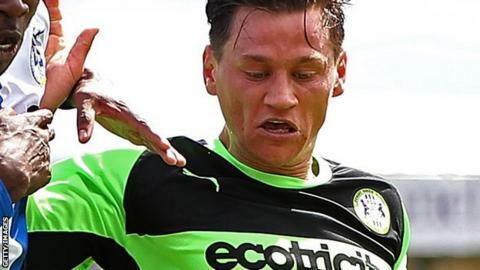 Forest Green maintained their 100% start to the National League season with victory over Lincoln City. Elliot Frear's free-kick fell to James Jennings, who fired home the loose ball, and Aaron O'Connor then pounced on the rebound from a Kurtis Guthrie drive to put Rovers two goals up. O'Connor missed a penalty minutes before Alex Simmons pulled one back for the Imps to ensure a nervous finish. However, Keanu Marsh-Brown lobbed Paul Farman late on to wrap up the points. "We knew it was going to be very tough, very hot conditions, but very pleased to get the three points. "Lincoln City are a strong team, they haven't lost this season until they came here. "James Jennings had a terrible injury last year and he was out for the whole season except for the last play-off second-leg game, but he's a very good footballer - it's been a tough road for him and when he scores a goal it's a credit to him." Match ends, Forest Green Rovers 3, Lincoln City 1. Second Half ends, Forest Green Rovers 3, Lincoln City 1. Attempt missed. Keanu Marsh-Brown (Forest Green Rovers) right footed shot from the centre of the box is too high. Delano Sam-Yorke (Forest Green Rovers) wins a free kick. Foul by Lee Beevers (Lincoln City). Substitution, Forest Green Rovers. Clovis Kamdjo replaces Rob Sinclair. Hand ball by Keanu Marsh-Brown (Forest Green Rovers). Goal! Forest Green Rovers 3, Lincoln City 1. Keanu Marsh-Brown (Forest Green Rovers) right footed shot from the left side of the box to the high centre of the goal. Assisted by Delano Sam-Yorke. Substitution, Forest Green Rovers. Jon Parkin replaces Elliott Frear. Attempt missed. Alex Simmons (Lincoln City) left footed shot from outside the box misses to the left. Jon Nolan (Lincoln City) is shown the yellow card for a bad foul. Foul by Jon Nolan (Lincoln City). James Jennings (Forest Green Rovers) wins a free kick. David Pipe (Forest Green Rovers) wins a free kick. Attempt missed. Connor Robinson (Lincoln City) right footed shot from the centre of the box misses to the right. Assisted by Alex Simmons with a cross. Offside, Forest Green Rovers. Kurtis Guthrie tries a through ball, but Kurtis Guthrie is caught offside. Delano Sam-Yorke (Forest Green Rovers) is shown the yellow card for dissent. Foul by Alex Simmons (Lincoln City). Attempt saved. Dale Bennett (Forest Green Rovers) header from the centre of the box is saved. Assisted by Elliott Frear. Attempt blocked. Elliott Frear (Forest Green Rovers) left footed shot from outside the box is blocked. Offside, Lincoln City. Alex Simmons tries a through ball, but Alex Simmons is caught offside. Aarran Racine (Forest Green Rovers) is shown the yellow card for a bad foul. Alex Simmons (Lincoln City) wins a free kick. Substitution, Forest Green Rovers. Delano Sam-Yorke replaces Aaron O'Connor. Goal! Forest Green Rovers 2, Lincoln City 1. Alex Simmons (Lincoln City) right footed shot from the centre of the box to the high centre of the goal. Attempt missed. Alan Power (Lincoln City) right footed shot from outside the box from a direct free kick. Foul by Dale Bennett (Forest Green Rovers).